In The Rafu every week you might see an ad about estate planning. In the ad, a man is looking at what appears to be his daughter. That gentleman might be a familiar face because he has appeared in numerous movies, TV shows, print ads, and commercials. You might have even seen him in a Super Bowl commercial! That JA actor, though not a household name, was Bill Saito. If anyone lived a Walter Mitty life it was Bill. He was not only an actor and stuntman but was also a coach and PE teacher in the Los Angeles Unified School District for 39 years. He was Warren Moon’s football coach! I had the good fortune to hang out with him every week at church for a few years before his passing. Bill’s father was from Maui and his mother from Sacramento. His father owned a farm growing vegetables. Bill’s mother was locally known for having the largest and best stall in the Oklahoma City Farmer’s Market. Bill’s father was credited with the greening of Oklahoma with his irrigation techniques during the Dust Bowl. He moved to Los Angeles during his middle school years. Bill’s classmates teased him about his Oklahoma accent. As a result he got in quite a few altercations during his youth in Los Angeles. Perhaps that is why he took up judo and would eventually become a fourth-degree black belt. Later he took up wrestling. Bill was a four-year letterman wrestler at UCLA. He was a good friend of the Olympic decathlete Rafer Johnson, whom he met in high school at a Youth for Christ camp. Bill was a loyal fan of UCLA sports, especially football, and had season tickets for over 40 years. How did Bill get into acting and stunt work? Bill got his start in acting at the age of 19. The director of the musical classic “The King and I” was looking for young boys who could wrestle for a scene in the movie. The director contacted the dojo’s sensei, who in turn recommended Bill, as he was one of the best. Bill was one of the Kralahome guards in the opening scene with Deborah Kerr. This was the beginning of his career in the entertainment industry. During his 56-year career in the entertainment industry Bill did it all. He appeared in numerous TV shows, movies, and commercials, and did print work as well as performed as a stuntman. The actors Bill worked with were a who’s who of the 20th century. If you check out his imdb entry, Bill worked with Yul Bryner (“The King and I”), Marlon Brando (“Sayonara”), Steve McQueen (“The Sand Pebbles”), Robert Mitchum (“The Yakuza”), Kurt Russell (“Big Trouble in Little China”), and Burt Reynolds (“Smokey and the Bandit”). One of Bill’s memorable movie scenes is in “Smokey and the Bandit,” where he is a truck driver who knocks the door off of Jackie Gleason’s patrol car while yelling, “Banzai!” In a Super Bowl commercial for Lipton Iced Tea, Bill’s friend David Carradine played a kung fu master, while Bill was a monk. This commercial was seen by millions of people. Bill also appeared in so many television series that I would have to write a separate article. He was a great storyteller. Every Sunday he told me tales of his career in Hollywood. He was never the star but a supporting player. If you mentioned a movie or TV show with a role for an Asian American actor, he probably auditioned for it or was in it. Movies appearances include: “Black Rain,” “Diamonds Are Forever,” “Airport 1975,” “Midway,” “Rush Hour 2,” “Uncommon Valor,” and “The Perfect Weapon.” He was in one of my childhood favorites, Dean Martin’s Matt Helm movie “The Wrecking Crew,” in the ’60’s. He did over a hundred commercials. 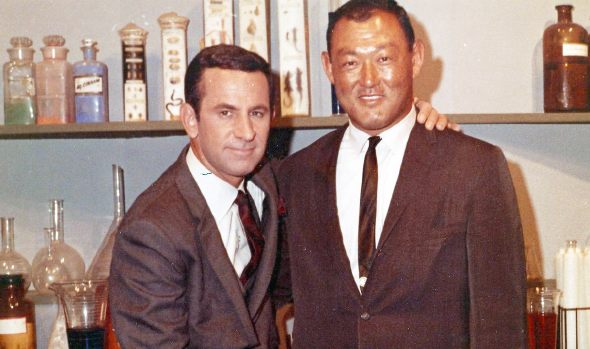 In 1967, Bill was one of the first Asian members elected to the Academy of Motion Picture Arts and Sciences. This meant he was able to vote for the Oscars. His daughter Jill would watch many of the movies and the actors that were nominated with him. As a result, she developed a lifelong love of the movies. 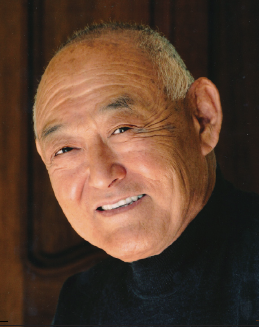 His granddaughter Akemi is a cinema studies major at NYU with the goal of becoming a producer or casting agent. He knew and worked with many Asian American actors. 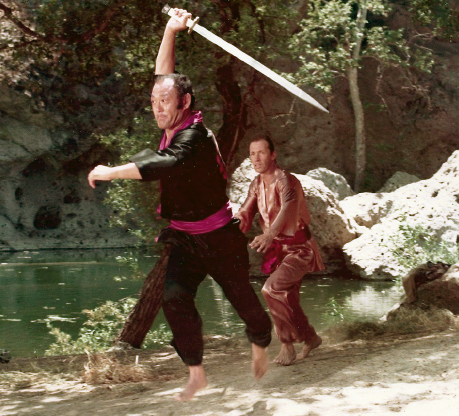 One of his great stories was about the time he took his students to visit the studio and they were able to meet a young Asian actor who knew the martial arts. That actor turned out to be Bruce Lee. Despite all of his fame, Bill was a humble man. He treated everyone like a best friend. Jill mentioned that he worked often because over the years he cultivated lasting relationships with those in the movie and television industry. 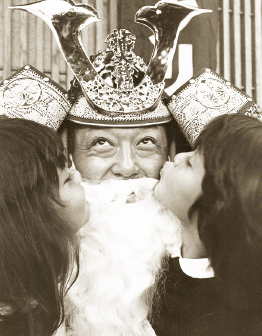 Bill Saito as Shogun Santa. He loved garage and yard sales. Bill loved collecting, especially sporting goods and equipment. He had over 100 baseball gloves. If he knew you had a hobby or interest, he would bring you an item related to that area. He was Santa Claus at church every Sunday and Shogun Santa in Little Tokyo. Sometimes when I am watching TV late at night or in the morning, there will be an old TV rerun. I will see Bill on the screen. In my mind, I’ll be saying, “That’s my buddy Bill Saito” or I will yell out to my wife in the kitchen, “Bill Saito is on TV.” If he came on late at night, I would stay up and watch what TV show or movie he had a small role in. Bill made numerous appearances in the ’60s, ’70s, ’80s, and ’90s. He was still active until his passing in 2012, appearing in a commercial for TireRack.com. Sometimes he was a good guy; at other times he was the heavy. Well, to me, Bill was always one of the good guys. 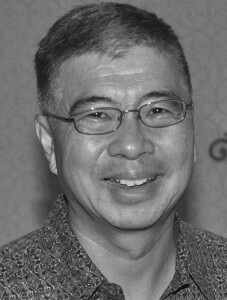 Bill Yee is a retired Alhambra High School history teacher. He can be reached at [email protected] Opinions expressed are not necessarily those of The Rafu Shimpo. Thanks. Bill was a great guy. bill was my science teacher back in 1983. you will never meet a nicer humble or caring man then bill. he was a great teacher and friend.